A pavlova is a light-as-air dessert that ‘s essentially a meringue shell cake. When made properly, it’s crisp on the outside, soft on the inside, and absolute perfection! Since meringues are best known for their consistency and construction, rather than their flavor, we think the perfect way to serve this masterpiece is with fresh fruit. We chose strawberries, but you can add any assortment of strawberries, raspberries, blackberries, or blueberries that you like! Similarly, we kept this recipe simple with a lightly sweetened whipped cream, which adds depth and texture, but a custard or mascarpone topping would be to-die-for as well. Pavlovas make excellent desserts at any time of year; full of whimsy and fresh flavors, you could make one for a summer party, just as easily as you could for a winter wonderland-themed event .ah, the beauty of cloud-shaped dessert! Anytime you want pure flavor and a truly beautiful presentation, try this amazing pavlova recipe! Preheat oven to 180º F and trace a 9 or 10-inch circle onto a piece of parchment paper. Turn parchment paper over and set aside. In a large bowl or mixer, beat egg whites and salt on high speed until firm. 1-2 minutes. Still on high speed, slowly add sugar until you ‘ve got stiff, shiny peaks. 2-3 minutes. Sift cornstarch to remove any lumps and place sprinkle on top of beaten egg whites. Add white wine vinegar and vanilla extract and use a rubber spatula to fold mixture together until incorporated. Don ‘t over mix. Spoon or pipe meringue mixture into drawn circle on parchment paper. Use your spatula to smooth it out and shape it to keep its disc form. Edges should be piled a little higher than center. Place in oven and bake for 1 1/2 hours. Then turn off oven and, keeping the door closed, let pavlova cool completely before moving. For whipped cream topping: In a medium bowl, beat cold heavy cream until firm peaks form. Add sugar and vanilla extract and beat until totally incorporated. Refrigerate. 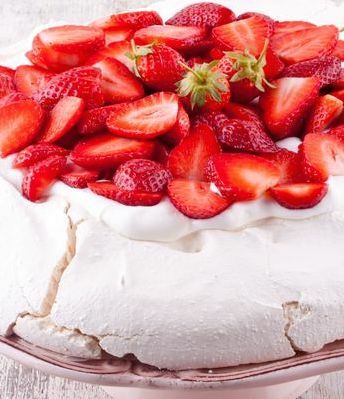 Transfer the pavlova to a serving plate, and top with sweetened whipped cream and sliced strawberries. Serve immediately.